Your guide to the blogging world! Anyone who is thinking about starting a new blog would definitely ask a question to himself "Why Blog?" and what are the benefits of the blogging? There are alternatives to blogging. Well, writing a new post is always been an enthusiastic endeavour to me. It opens new ways of possibilities. 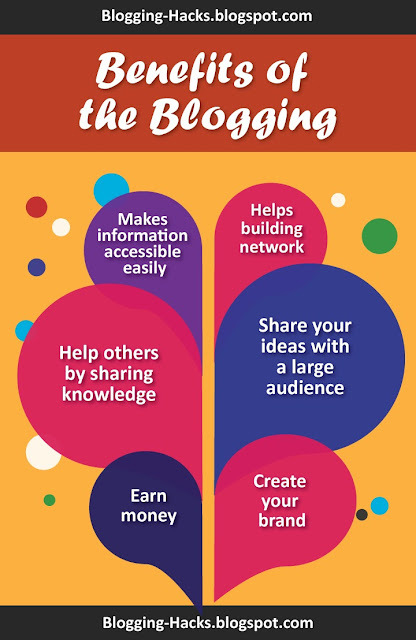 There are several benefits of blogging to your business and to you even if it just personal blogging experience. I have been blogging since 2006 and it's been a good learning affair so far. Back then everything used to be different. There have been lots of changes in design patterns, promotion strategies and in SEO techniques (..😵). What has not changed is the way people connect with each other through their blogs. I own three blogs and SMS Gallery has been more successful than other two blogs in terms of earnings as well as popularity it gave. Currently, it ranks in the first three results (sometimes at first place) in Google search results. I have personally experienced below mentioned benefits of the blogging with SMS Gallery. Thanks to all those fellow bloggers and the lovely audience who helped me reach there. Here at Blogging Hacks, we will be discussing ideas and tricks on how we can improvise our blog's appearance and rank in search engines. It would be a great pleasure to help you with blogging related queries if you have any. 1. Share your ideas with a large audience. Blogging is a platform where you can express your innovative ideas to the audience all across the globe. A skilled photographer can reach his/her end-audience through a blog and gain all fame he deserves. One of the greater benefits of the blogging is that it provides you a platform where you can reach millions of users and promote your explorations. This vast ocean of users will give you many experiences and your product would be more refined and improved in the process. Express yourself as an expert in your area of work. To do so, you will have to constantly study and build the knowledge base. Through your blog posts, you will be communicating with the vast audience. If you are on the right path, many people would like to subscribe to your blog for the righteous information with the facts you are providing. This way you will be creating a community of individuals who keep same interest and have great influence on the content you are sharing. Who doesn't love free money! We all do, right? The principal benefit of the blogging which comes in mind of any blogger is that will I be able to make money out of it. The content you post on the blog can earn money for you. But it's not that easy. You will have to provide quality content or services to visitors. The better your services, the more visitors you will likely have and earning in return. There are various options available to earn money. If you have good writing skills, work as a content writer, or post ads on your blog and earn money by means of advertising, a blog owned by you can be sold for money, design premium templates and sell them for money, so on and so forth. We will have a deeper look at how we can make money through blogging in coming posts. 4. Help others by sharing knowledge. If you are good at problem-solving skills, help others by sharing your knowledge. It may help someone make his/her day better. Listen to the queries your visitors might have and provide them a solution. It is said that knowledge grows upon sharing. It helps you grow. Through a knowledge sharing process, you involve yourself in a conversation and as I said earlier you open a new way to possibilities. You never know you may learn something in the process. Blogging and social media, both will let you share content with the audience. However, they have different purposes and benefits of their own. The substantial benefit of the blogging is that the content you post on the blog will stay there forever and is easy to access. Visitors can access it with the help of URL, link it or share it. Social media can be thought of as a medium to share this content. It might let you reach the largest audience, but it is not easy to find the desired content through the vast list of posts coming on social networking platforms. Besides networking, blogging let you build a stronger community and other benefits we discussed earlier. I have written an article on How to Get Traffic to Your New Blog by using social media. Turn your blog into a brand by providing creative services and quality content. Connect with your audience on a frequent basis, arrange events for visitors to participate in, get known in a community for the divergent services you provide. These all are ways of building an effective brand name. It will help you get recognized as a brand and stand-out from the rest. Do let me know through your comments if you liked this article. Also, share, comment and do not forget to follow this blog. Read our next article on how to first blog post. Great inspiration to get gong with the blogging!.. Hi. I am Ramesh Wetkoli. Three things I try to include in my blog posts are creativity, useful insights, and trendy information. I.T. graduate and working professional. I have leveraged 6+ years of work experience in I.T. industry and learnt various technologies, providing merchandizing support and handling digital marketing responsibilities. Blogging Hacks : All Rights Reserved.